Acne is the most common skin condition in humans. 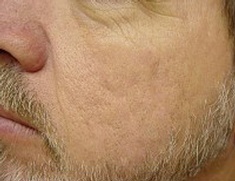 Acne develops where there are more oil glands present, e.g. face, scalp, chest, back and neck. There are many different types of acne and each patient should be treated according to their particular case. The inflammation associated with the lesion can damage skin tissue causing it to collapse and leave a scar. These scars can manifest in many forms including “ice pick” scars. A series of Vibraderm™ and Laser Genesis treatments are both safe ways to reduce the appearance of acne scars.